One of my Dad’s favourite quotes is great expectations lead to great disappointments. He quips this to me often and I usually respond by teasing him about being a pessimist. For example, I wanted to go to Iceland for six years. My parents later told me they’d been worried that it wouldn’t meet my admittedly very high expectations. When I did finally make it, it absolutely blew me away. Truth be told, I’ve had a pretty good run with most places I’ve visited. Unfortunately, Cuba wasn’t going to be one of them. We touched down in Havana, after leaving Miami. It was the day before my birthday and I was in pretty good spirits. 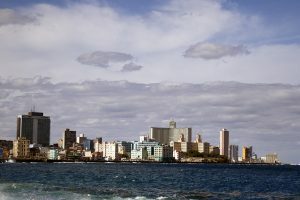 Havana was a city I’ve wanted to visit for years and I was in the company of my spunky boyfriend. 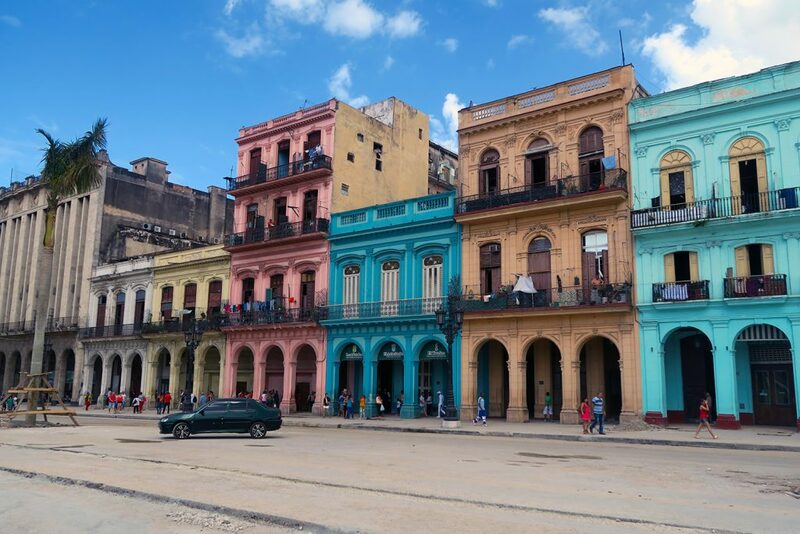 My first impressions of Cuba were positive – I felt it in my bones that it was going to be a pretty good trip. We got off to a fairly all right start. As is usually the case, we were waylaid at the airport by a taxi driver. He led us out to his car, telling us that the price to get to our accommodation would be 30 CUCs (of course we were overcharged and of course I wouldn’t figure that out until later on). Even at the time we’d mmm’d and ahh’d about paying that particular price. It didn’t get old – sliding into the backseat of a sometimes 70 year old car, of some outrageously bright colour. The upholstery would usually be torn and seat belts non-existent. 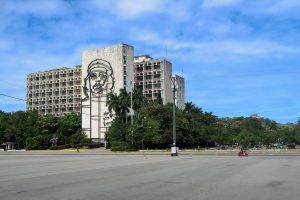 Yet, most drivers had taken the time to install CD players that would belt out Cuban tunes as we zipped around the streets of the country’s capital. If someone asked me to describe Havana in one word, I’d pick “loud”. 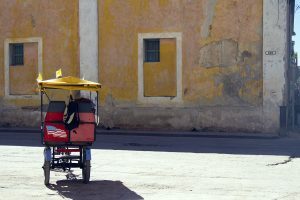 Our driver alternated between singing off-key in Spanish and honking his horn at pretty much everyone he passed. At one point he opened his car door on the road to yell at someone sitting in traffic next to him for their poor driving. He shut the door and shook his head at us in wonder. “I know,” I said, sympathetically. When we finally reached our casa, we lay down on the bed and just listened. A cacophony of noise filled the room. Music pulsated from a house across the road, stray dogs barked and growled at one another, people called to their neighbours as they walked down the street and vendors filled their air with calls for their wares. We were accosted by sound from every corner. We didn’t care. We turned to each other, with wide grins. We were in Cuba, at long last. My birthday turned out to be… strange. I’ve been an expat for almost two years now and have become well acquainted with being countries away from family and friends on special occasions… but cut off from them entirely was worse than I could have ever anticipated. I rather felt like my birthday never happened. I was twenty-six when I left London and now I’m home and I only know I’m twenty-seven because I can’t use my rail card anymore. As it was our first full day in town, we didn’t really know what to do with ourselves. So, we wandered around snapping photos of all that was weird and wonderful within Havana. I had had vague hopes of making it to the opera that night, but we were turned away at the door. For the records, tickets go on sale every Tuesday for the following weekend. 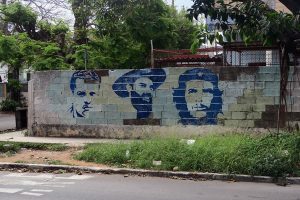 We weren’t to spend a single Tuesday in Havana, which was a great disappointment. We left the city the next day, having pre-booked a bus to take us to Trinidad. It was a five hour journey and we were sat up the back – meaning we could feel every single bump in the road. It wasn’t too long before I started to feel queasy, but I wasn’t too fussed. London buses have much the same effect. The Viazul bus we had booked onto was much fancier from the outside that it was in. I’d been very excited by the addition of a toilet onboard the vehicle, but was dismayed to find out the door was locked. We made a pit stop a couple of hours into the trip, where we were given the options of ordering some questionable looking sandwiches and using the loo. I skipped the food and went straight to the toilet. There was a lady standing beside the door, handing out bog roll for money. I was prepared for once – I’d packed my own. I pulled it out and marched towards the door. The attendant yelled at me as I tried to move past her into the toilet. As it turned out, it was the entry itself that negated a fee – the toilet paper she gave out was just a bonus. I handed her a 1 CUC note and waited for the change that never came. It’s cheaper to use the toilets in Piccadilly Circus and they come with toilet seats! I sulkily boarded the bus, where we waited for the next ten minutes for an oblivious fellow traveller to stop taking photos of the local flora and make her way back to her seat. We were then on our way once more. The excitement was far from over for the day. Our bus journey was drama free, until the very end. We moved from tarred road onto cobblestones and suffered accordingly, bouncing this way and that. My stomach wasn’t the only one that was churning. A boy leapt out of his seat and ran for the door of the toilet, discovering much like we had that it was bolted shut. We watched on as he made his way to the front of the bus, presumably to negotiate with the driver for the key. We were then interrupted by the much more interesting spectacle of his seat mate and friend throwing up all over both the floor and the girl who had held the whole bus up earlier while taking photos of trees. As I am a terrible person, I couldn’t help but be filled with a sense of schadenfreude. It was short-lived. My own motion sickness did not abate – two hours later I was chundering into the toilet of our casa in Trinidad. The honeymoon period of our trip was over – it was all downhill from here on in. 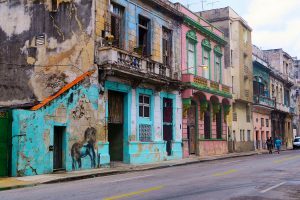 If you’re on the prowl for some more practical tips for travelling through Cuba, this post is more informative, rather than narrative. LC can often be found nursing a cup of green tea, with her head in a book. She is a writer, video editor and professional cheese eater. Her life's aspiration is to one day live on a farm in Tasmania with 11 dogs, a Shetland pony and several pygmy goats. Hello, my name is LC. I’m passionate about the environment, green tea, brunch (the most beloved meal of any urban Australian), travel, books and photography. This is where I write about all things sustainable, backyard travel in Oz and odd things to do and eat around the world. Oh and I’m crazy about birds.